My daughter, who’s seven, is the average girl – she loves Barbies, puppies and babies. She’s silly, giggly and sometimes just plain crazy. She’s also very clever and artistic. One of the funniest things about her, though, that makes her stand out from her peers, is her love for armadillos. 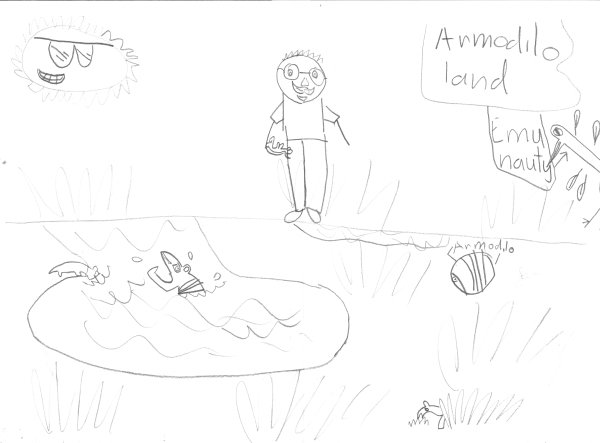 Yes, it’s true, my daughter’s favorite animal is the armadillo. She’s never even seen one in real life, but while her classmates draw pictures of horses, dogs, birds or dragons, my daughter draws armadillos. She’s recently became interested in cooking and baking, even watching and becoming engaged in MasterChef. A couple of weeks ago, I posted a recipe that she loves which she actually prepared by herself – tuna pasta salad. She then wanted to try to make muffins or cookies on her own. We chose blueberry muffins from Inspired Taste to start with. She has helped me prepare batter or dough in the past, but I’ve never actually handed her a recipe and said “go for it!” (I don’t have that much patience!). It was a very exciting time for her! 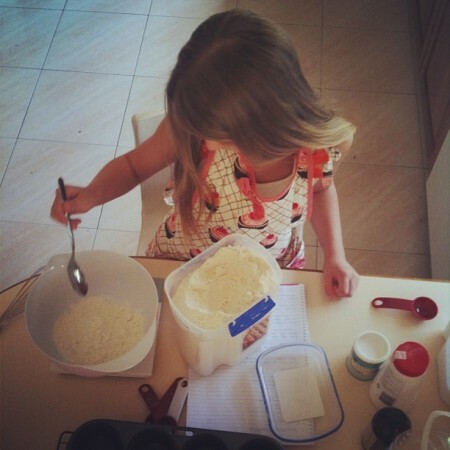 I wrote down her recipe and with a bit of help on how to measure flour, and which was the baking powder, she did a brilliant job preparing the batter (while wearing my Jessie Steele apron that I won from Iron Cupcake: Earth!). She also learned a few things, like how to let cold ingredients come to room temperature, not to over-mix the batter to ensure she’ll have soft, tender muffins, and to know when the muffins are done without having to use a toothpick or cake tester (muffins should spring back when lightly touched on the their tops with a fingertip). We didn’t change much about the recipe, except using vanilla bean paste instead of vanilla extract, and we sprinkled the tops of the muffins with demerara sugar instead of regular sugar. I placed the muffin tin in the oven for her and then we waited, watching excitedly as the muffins rose and turned golden. Their aroma was heavenly as they were baking. I just couldn’t wait to take pictures of them, because they looked gorgeous in the oven! They did, in fact, turn out to be quite photogenic! These lovely muffins, with fresh blueberries, have a perfect golden and crunchy top. My daughter was quite pleased with herself and could barely wait for them to cool down to sample one. 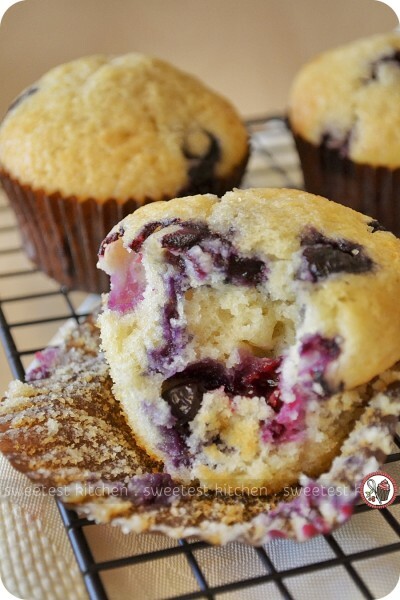 The insides of these delicious muffins were so soft and tender, filled with beautiful juicy blueberries. 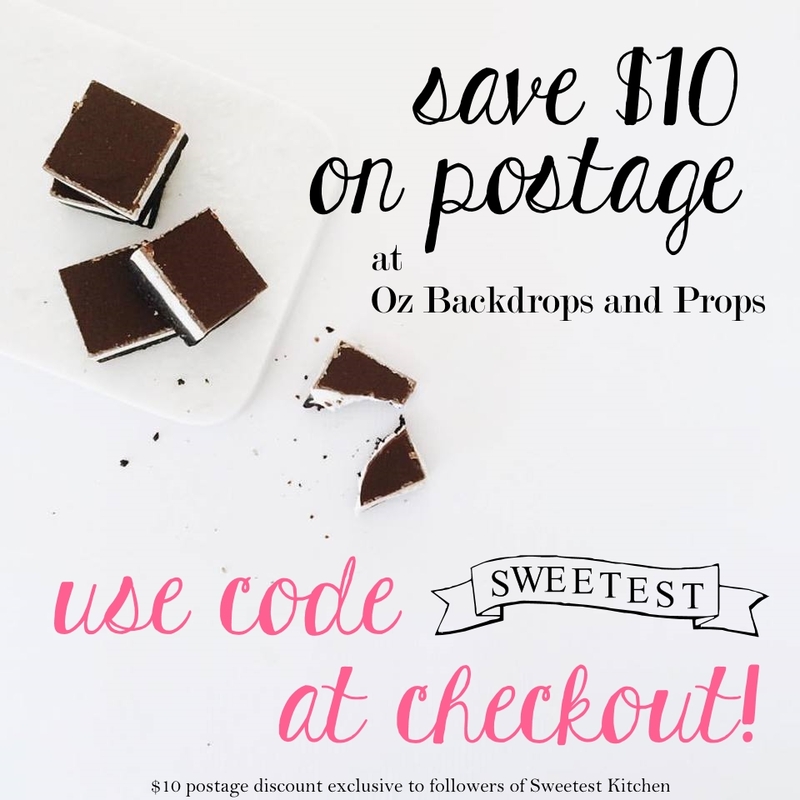 We all fell in love with these little morsels and I’m sure this is going to be a staple recipe from now on. Next time, I may try adding a bit of white chocolate chunks to the batter! These lovely soft, tender muffins with a golden and crunchy top are perfect for morning tea with a cuppa. Line 8 standard-size muffin cups with paper liners. Add 1 to 2 tablespoons of water to the 4 empty muffin cups (this helps to make sure the muffins bake evenly). Combine flour, ¾ cup of the sugar, baking powder and the salt in a large bowl with a whisk. Set aside. Add ⅓ of a cup of vegetable oil to a measuring jug that holds at least 1 cup. Add the egg then fill the jug to the 1-cup line with milk (this should be ⅓ to a ½ cup of milk). Add vanilla extract then whisk until combined. Pour milk mixture into the flour mixture then use a fork to combine. Do not over mix. 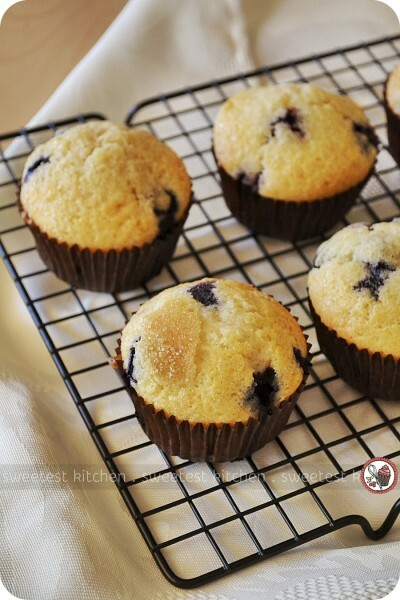 Use a spatula or spoon to gently fold the blueberries into the muffin batter. Divide the batter between the 8 muffin cups. The batter will come to the tops of the paper liners. Then, sprinkle a little sugar on top of each muffin. Bake muffins 15 to 20 minutes or until tops are no longer wet and a toothpick inserted into the middle of a muffin comes out with crumbs, not wet batter. Transfer muffins to a cooling rack and cool completely.